Why are so many drivers hitting students around Western Hills High School? 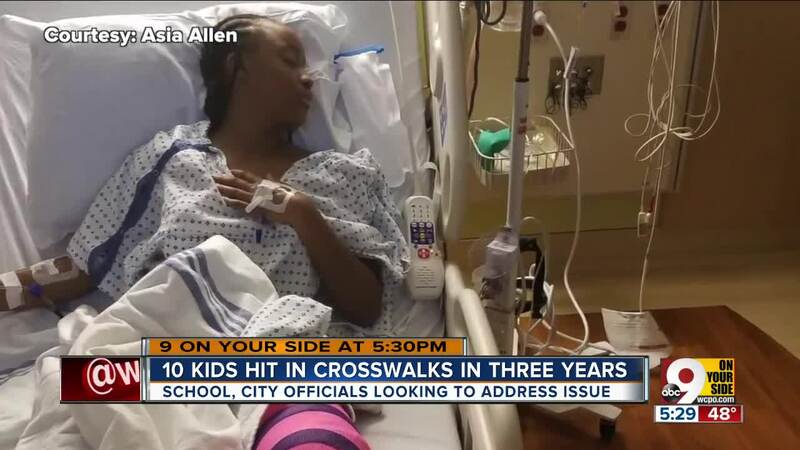 CINCINNATI — When Asia Allen got the phone call last Friday morning to learn that a car had struck her daughter outside Western Hills University High School, it was a frightening but familiar feeling. "It was like déjà vu for me," she said. "Two years ago, I got the same phone call near the same location. The same thing happened to my son." When a yet-unidentified driver struck Gilbert A. Dater High School seventh-grader Kenya Joy Austin before fleeing the scene, the 12-year-old joined her older brother as a victim of the ongoing string of crashes involving students walking near Western Hills and Dater high schools' shared campus in West Price Hill. School officials estimate at least nine students have been struck in the schools' vicinity over the last three years, including Austin last week. Dater High School Principal Stephen Sippel was with Austin while she waited for an ambulance and rode with her to Cincinnati Children's Hospital Medical Center. He recalled the trauma of the moment: "She was writhing in pain and screaming because she didn't know what exactly had happened," he said. "For her, she just replayed the event over and over again the entire way to the hospital, while she was being cared for in the ER. "She just kept saying, 'I can't believe this happened. I can't believe this happened.'" Sippel told WCPO that the two schools' combined security staff can monitor some of the half-dozen or so crosswalks in the area, but they don't have the resources to watch them all. "We have security officers at some of the crosswalks, but not all," he said. "There are other immediately adjacent crosswalks nearby, like directly behind me at BP right at Glenway and (Sidney), that are completely unpatrolled and also completely inadequate as far as crosswalks go." Directly outside Western Hills' front entrance on Ferguson Road are four crosswalks, all with signage -- and one with a mid-street pedestrian paddle sign -- to warn drivers that students might be crossing. But with the convergence of Glenway Avenue and Ferguson Road, and Prosperity Place cutting across, there are several crosswalks two minutes away or less on foot from the school's entrance. Making sure students get to the building safely is a bigger challenge during morning arrival time than afternoon dismissal, Sippel said. "We have plenty of support in the afternoons because all the buses arrive at the same time, but in the mornings, buses arrive at different times, so it's not like we can have immediate presence all at the same time," he said. Eve Bolton with the Cincinnati Public Schools Board of Education said she wants to see even more safety features installed outside all CPS high schools -- not just Western Hills and Dater. "The problem is created because we do not have enough safety equipment, safety warning equipment -- be it lights or be it crossbars or what have you -- because the city of Cincinnati has not spent that money around our high schools," she told WCPO. 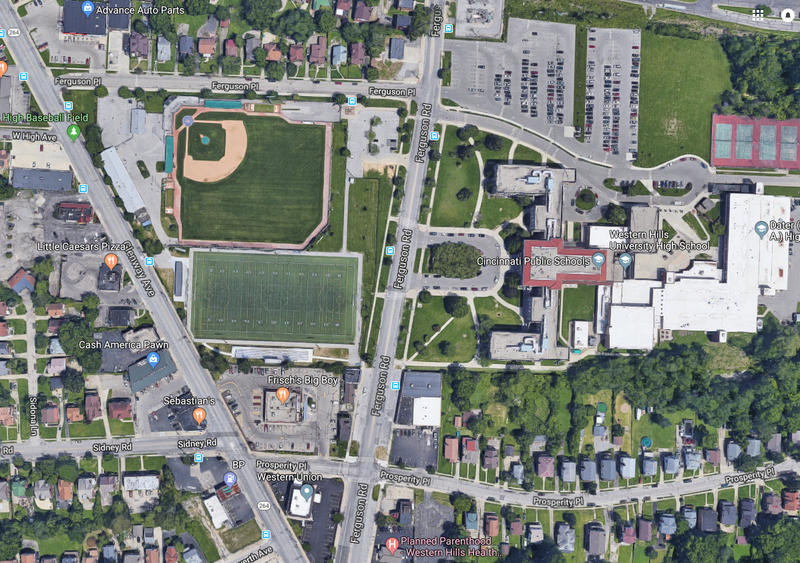 Ohio state law requires that cities provide a certain level of pedestrian safety infrastructure around elementary schools, but it doesn't have as strict regulations surrounding high schools. "The high schools are left out. There's just no question about it," Bolton said. Having enough crossing guards is another challenge -- again, especially at the district's high schools -- Bolton said. "A number of neighborhoods have asked for additional crossing guards," she said. "We need additional crossing guards, as well as that infrastructure of safety equipment around our high schools." But even in Austin's case -- she was crossing Ferguson in a marked crosswalk at the time of the collision -- the crash still occurred despite all the right pieces being in place. That has City Councilman P.G. Sittenfeld thinking more enforcement is necessary. "Where this has left me is -- there is signage in these places, engineering things we have done, installing crosswalks, but I think the more that this happens -- the unacceptable amount that this happens, I think there just needs to be a massive uptick in enforcement," he said. "Obviously, that means resources," he said -- resources that Cincinnati police acknowledge are perpetually thin. As WCPO has reported extensively over the last year, after a 60 percent decline in traffic citations issued by Cincinnati police officers between 2012 and 2016, the department has shifted some resources back to increased, targeted traffic enforcement . "I am not convinced at this moment that signage and engineering is going to get the response from reckless drivers like whoever the coward who did this hit-and-run is," Sittenfeld said. Bolton said she and the rest of the board are presenting City Council with a list of requests at Wednesday afternoon's council meeting -- including increased pedestrian safety infrastructure and help with providing more crossing guards. "We need the city to take its responsibility," she said. "We don't have jurisdiction out here, and, indeed, when we've got a number of our own employees doing a lot of the journeyman work up here on this street, the reality is the police department would say, 'You really don't have jurisdiction to do that.'" Responsibility falls on the students, too, Sippel said. "A lot of kids are either crossing against the light, crossing with the light, sometimes even jaywalking very dangerously," he said. Bolton said it's the schools' responsibility to make sure students know and are following safe crossing practices. "We have to also make sure that our students are respectful of the rules and regulations about dismissal," she said. Allen said Austin has returned home from the hospital and is still recovering. "These children can't keep getting injured and nobody take notice," she added. "It's just ridiculous." Allen also knows her two children are, comparatively, two of the lucky ones. In September, 15-year-old Western Hills freshman Gabriella Rodriguez was crossing Harrison Avenue to catch her Metro bus when two separate vehicles struck her . She died from her injuries later that day. Police said that case was also a hit-and-run. Detectives are still searching for the car and driver that fled that scene. "How many children have to be injured or potentially killed before change occurs?" Allen said.